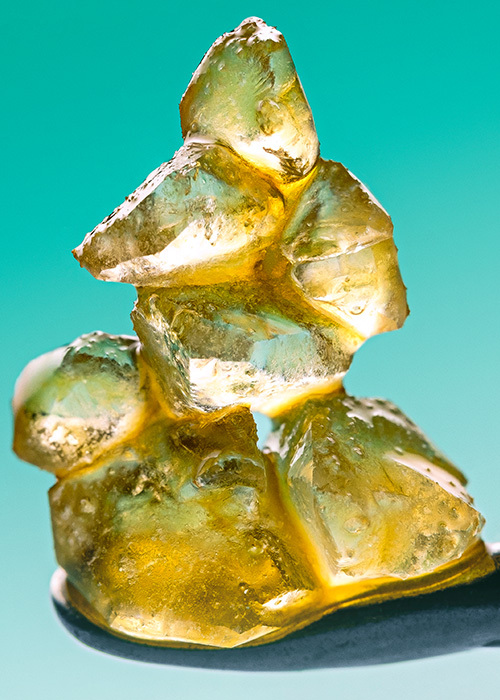 Seattle photographer Steinfarm captures the glory of the THCA diamond, a beautiful and potent extract that might not survive in legal cannabis markets. Diamonds have been considered the quintessential precious gems since the age of antiquity —unadulterated expressions of the crystal form, prized both for their luminous clarity and all-but-unbreakable strength. This innate fascination with carbon diamonds is partially behind the rise of THCA “diamonds,” the latest craze in cannabis extraction and the reason your dispensary’s concentrate shelf looks like a jewelry store display case. Steinfarm, a Seattle-based photographer who specializes in photographing THCA diamonds, says that the similarities between the two types of diamonds was central to his transition into professional cannabis photography. Before becoming a cannabis photographer, he spent eight years working as a commercial product photographer and the majority of his clientele were in the jewelry business. The most common item he was paid to photograph? Diamond rings. As it turns out, there aren’t that many aesthetic differences between carbon diamonds and cannabis diamonds, and as soon as he started photographing them, Steinfarm realized he already knew what he was doing. That similarity explains the appeal of cannabis diamonds, but what are they, and why does it seem like they’re everywhere lately? The diamonds are made from THCA, which is the acidic compound in the plant that becomes THC when it is exposed to heat. Crystalline THCA has been widely available for several years, but even at purity levels as high as 97 percent, it tends to have a powdery appearance to the naked eye. Then, Guild Extracts in California pioneered the use of molecular isolation and became famous for their large THCA crystals with purity levels over 99 percent. Some other companies managed to more or less reproduce Guild’s results with lower potency isolation, but the large crystal refinement wasn’t ever consistently replicated by anyone else, largely because of how technically involved the process is. Then, as the tastes of dabbers turned from shatter to sauce, which is basically just a semi-separated mixture of viscous high-terpene extract and small THCA crystals, extractors found a simple, low-tech method for encouraging larger crystal formations. These “sauce diamonds” have become an object of obsession for many concentrate connoisseurs and are a favorite on social media, where their striking aesthetics make for some dazzling imagery, whether it’s a casual snap from a bragging dabber or a studio portrait of a massive crystal. Cannabis extraction, in general, is all about removing inert plant matter and isolating the primary cannabis compounds desired by humans, which break down into two main groups: terpenes and cannabinoids. Terpenes, which give cannabis its unique spectrum of scents and flavors and play a crucial role in the entourage effect (the idea that cannabinoids work best in harmony with one another) are liquid at room temperature and regular pressure. On the other hand, cannabinoids — compounds which directly interact with your body’s endocannabinoid system to produce the physiological impacts of cannabis consumption — take solid form under typical conditions. Almost all cannabis concentrates contain both terpenes and cannabinoids, making them susceptible to a process called nucleation, which ultimately causes them to separate. If you’ve ever seen what happens to an old envelope of shatter, then you’ve witnessed the result of nucleation, which is fundamentally the same physical process that creates sauce diamonds. The difference is that when shatter nucleates, it generally doesn’t form crystalline structures, at least not ones that you can see. But using a simple process sometimes called “jar tech” or “diamond mining,” you can create large crystal formations using little more than time. 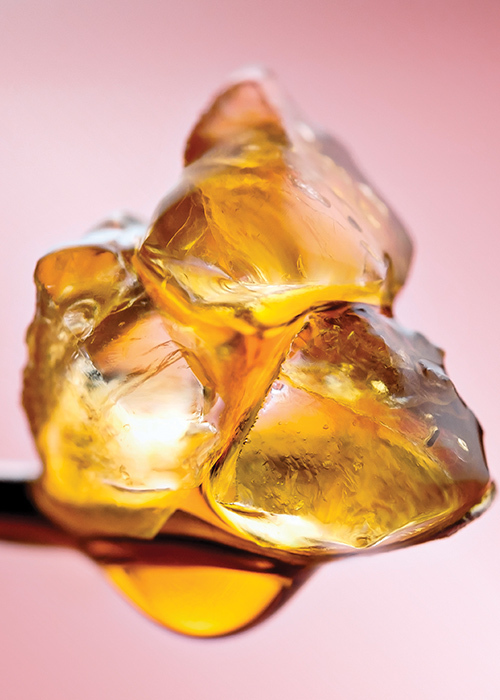 As I noted in my book with cannabis legend Ed Rosenthal, “Beyond Buds: Next Generation,” most large sauce diamonds start as BHO live resin, which is created by running fresh or flash frozen cannabis (instead of cured buds) through a closed loop extractor. The resulting oil receives a light purge without a vacuum to offgas most of the oil’s residual solvents. The liquid that remains is poured into jars and left alone for two or three weeks, at which point there should be substantial crystal growth. The process is based on separation, so you’ll also get a viscous, high-terpene extract with cannabinoid crystals. Some extractors will boost crystal formation by adding other solvents, but not Josh Zeise, lead extractor at DabX, an extraction company based out of Oak Harbor, Washington that specializes in sauce diamonds. Steinfarm says DabX diamonds are some of his favorite to photograph, and a glance at these images explains why. But he stressed that the quality can be both seen and tasted, and that he’s yet to find anything else quite like it in the Pacific Northwest. Zeise said it’s fun to watch the crystals form in the jar, and that for a certain kind of cannabis consumer, dabbing a big THCA diamond is the ultimate experience. However, he said he also makes sauces with smaller crystals for those seeking a more even-handed potency. When it comes to Zeise’s favorite form of cannabis? It’s the same answer you hear from about 80 percent of extractors and hash makers. The science behind “jar tech” is relatively uncomplicated, but as with many facets of the emerging legal cannabis industry — particularly in California — the regulations concerning extraction are dense and sometimes a bit arbitrary. Rodney Galgiani is the head of extraction at Apex Solutions in Oakland, California and is responsible for their top-shelf products, including those from leading NorCal brands like Terp Boys. He says regulatory restrictions make “jar tech” as it’s practiced illegal. At issue are the glass jars used to store the crystallizing hash oil. These containers don’t comply with the stringent process requirements for extractors under California’s regulatory framework, and while Galgiani has experimented with other containers and workarounds, he says it’s proven to be more trouble than it’s worth. He said the profit margins are already so slim that creating compliant procedures is hardly worth it. Unfortunately, he says he doesn’t see big sauce diamonds featuring in the legal market moving forward. During a visit to the Apex laboratory, he pointed to a 2-ounce jar filled with big, glimmering crystals sitting inside a vacuum oven. Of course, the regulatory hurdles that seem poised to slap the lid on jar tech won’t affect producers like Guild, who create crystalline THCA diamonds using other proprietary methods, but if it becomes a little easier to distinguish your cannabis social media feed from a boutique in Antwerp in the coming months, you’ll know why. Industrial applications notwithstanding, carbon diamonds are predominantly valued for their dramatic appearance in jewelry, and it’s really no different where THCA “diamonds” are concerned. From a practical standpoint, it doesn’t make sense to chase large THCA diamonds. Most obviously, smaller crystal formations more evenly distributed throughout a terpene-rich base allow for more uniform potency. But also, the smaller crystals in terp sauce are quicker to produce, there are fewer testing and regulatory headaches for the extractor, and on balance, it’s a more useful product for the consumer. Still… I find myself gazing into the glimmering asymmetry of a 2.5-karat THCA diamond, regarding its luminescent clarity with a dreamy smile I’ve never given to a half-gram of hash before. I gingerly clutch the shimmering crystal with a pair of tweezers and raise it into a sunbeam that’s captured and refracted into prismatic flashes of sparkling rainbow light. These become more intense and frequent as I subtly tilt the diamond in the light, and for a moment I’m mesmerized, lost inside its jagged natural facets. My hypnotic trance is broken by the insistent electric screeching of a timer I’ve set for my dab. With just the slightest pang of regret, I drop the gem into a warm banger. It melts into a bubbling puddle and vanishes into a wisp of mist and rides the light once more, as I exhale upward and that same sunbeam illuminates an angular blade of vapor, framing the turbulent trajectory of whirling spectral serpents on their first and final flight. Diamond Mining: A Photographer’s Journey Inside the Super-Shiny World of THCA Diamonds was posted on Cannabis Now.